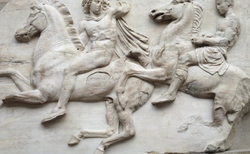 Greece has been demanding return of the Parthenon marbles. This time, however, the Greek government has the support of the UN’s cultural organisation UNESCO. According to UNESCO, this will mark the first time that the institution will act as an arbitrator over a cultural dispute. However, this will only happen if Britain agrees to an open dialogue about the marbles. Panos Panagiotopoulos, the Greek Culture Minister, held a meeting on Sunday in Athens with Parthenon reunification supporters. It was the start of a relaunch campaign to at last bring a solution to the contested artefacts. UNESCO sent letters to William Hague, the British Foreign Secretary; Maria Miller, the Secretary of State for Culture, Media and Sport; and Robert Neil MacGregor, the Director of the British Museum. These letters officially inform the British government of Greece’s intentions to move forward and finally reach a resolution on this matter. However, there are skeptics who believe that a resolution will never be reached. He also said that the British Museum has a peculiar relationship with the government. According to him, the museum has a direct line to the government, but "nothing comes down". “It is very difficult to work with an agency who is part of the government but is disowned by it,” he added. The professor said it was not unusual for there to be an unspoken pact between the government and museum board of trustees. Behind closed doors they agree that Parthenon Marbles will not leave the museum. Still, past refusals have not deterred Greece. Over the summer, Panagiotopoulos met with the Director General of UNESCO Irina Bokova in Paris. They discussed the possibility of Bokova using her influence to open discussions between Greece and the British government. In the meantime Greece is waiting for the British government to respond to UNESCO’s letters. Supporters are hoping that a fruitful dialogue can begin at last.